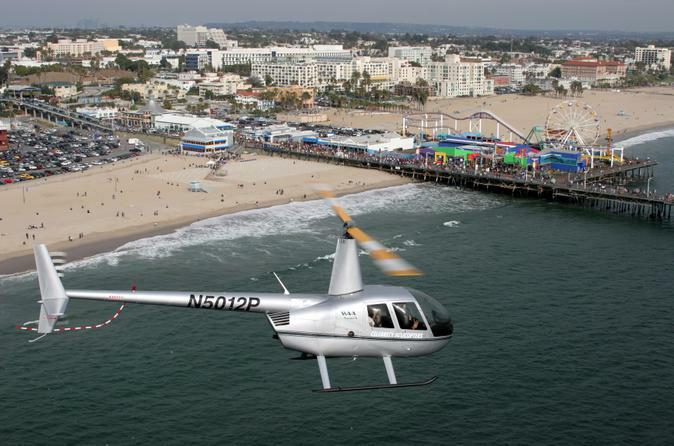 Before or after your cruise, enjoy the longest helicopter tour in Los Angeles (55 minutes! ), and travel like a VIP with port transfers by mini-limousine! You'll see all the highlights of LA including the beach cities of Redondo and Manhattan, Beverly Hills, Marina del Ray, celebrity homes and, of course, the Hollywood sign. Upgrade to the Hollywood-Style Tour, which includes sparkling wine and snacks in your mini-limo. Los Angeles is one of the most scenic cities in the USA, and there’s nothing like seeing it from the air! Before your ship pulls out of the LA port, or after it docks, fly high on this VIP helicopter tour that includes port transportation in a mini-limousine. Upgrade to the Hollywood-Style Tour! Upgrade your flight package to see Los Angeles Hollywood-style. Your upgrade includes the following A-list comforts: Sparkling wine and a wide variety of snacks in your mini-limo, a unique souvenir T-shirt and a professional photograph to help you cherish this helicopter adventure.